Captain's Corner is reputedly the longest running dive and snorkel center in Key West, operating since 1985. The dive center is a PADI Gold 5 Star facility and is located conveniently in the heart of Old Town Key West. 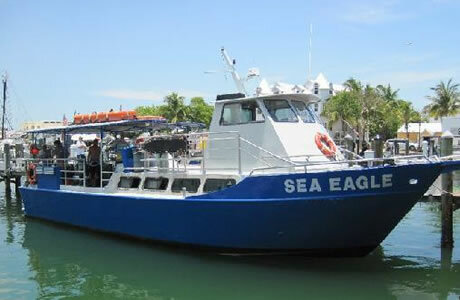 Captain's Corner provides dive training, trips aboard the Sea Eagle, tech diving, and more. There are a number of different courses available depending on your skill level. The Discover Scuba Diving Resort Course is perfect for getting your feet wet if you're a beginner. There are also refresher courses for experienced divers who have been away for a while and a number of intermediate and advanced courses. Technical diving and decompression diving courses are a special feature of Captain's Corner. If you're interested in diving in very deep waters, these courses will teach you what you need to know to do so safely. Scuba trips are offered to shipwrecks and reefs throughout the Florida Keys waters. These include dives to the famous Cayman Salvager, outer reef dives like Hammerhead Hill, Lost Reef and Trinity Cove, technical dives to the USS Wilkes Barre and USS Curb, and dives to the newest wreck in the Keys, the Vandenberg. Daily scuba and reef dives that are appropriate for all skills levels allow you to enjoy the marine wildlife the Keys are famous for, and there are also exciting night dives which give you a chance to meet the nocturnal residents of Key West's waters. The dive trips go out on the Sea Eagle, and the company has received many excellent ratings from customers, who say the staff members were friendly and that the trips and training were safe and fun. Beginners in particular say that they were impressed with the experience, even those who were initially cautious about the idea of scuba diving. The Captain's Corner staff will make sure you feel comfortable and have a great time.